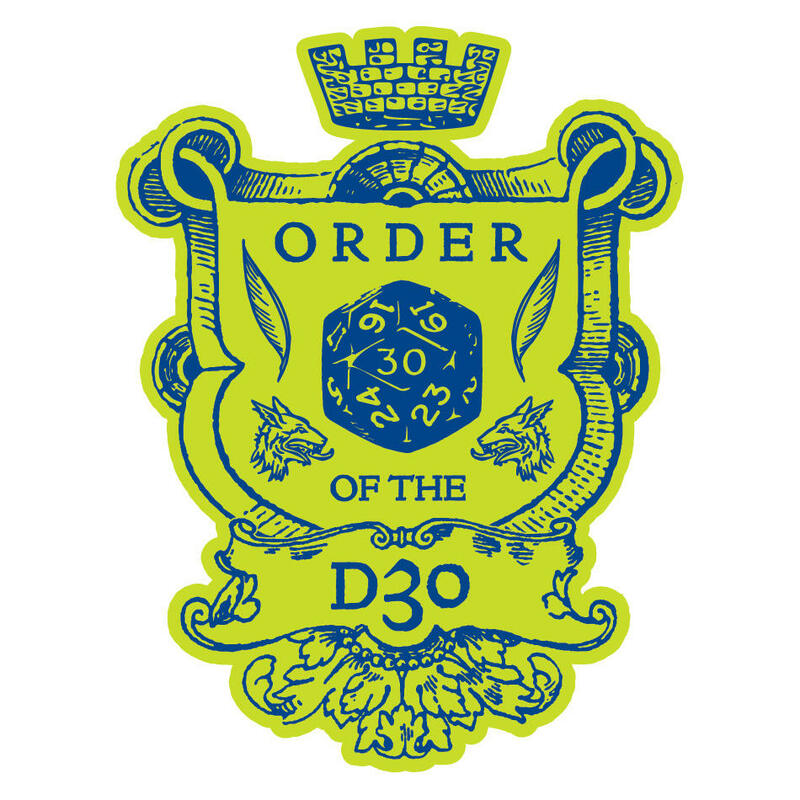 So if you've gotten some holiday cash or just have money and want to throw it at some creative projects, here are a few things going around the OSR that I wanted to highlight. I know I don't usually shill for things but with 2014 coming around the corner, I thought this would also be a good way to showcase some things I like that should be out next year. The Islands of Purple-Haunted Putrescence by Venger Satanis. This one still hasn't reached its funding goal. Venger Satanis is best known for his previous module, Liberation of the Demon Slayer, a dungeon crawl; this one is an island module. The KS is $1,149 short of its $3,500 goal, but really I'd like to see it at least hit $5,000 and the first stretch goal - getting everyone involved a longer module. The current length of 32 pages is still a bit shy of what I'd prefer. But I think there's a good deal of potential here, and I'd like to see the module at least fund. It's high gonzo - space aliens, demons, Lovecraftian entities, fantasy tropes all mixed up in one big weird package. Specifically, adventurers will explore three islands in close proximity that have been visited by a wyrm-riding empire, extra-dimensional invaders, space aliens, Elves, Dwarves, Humans, and more. They'll find black pylons enabling time/space travel, an devil-god worshiping temple of extra-dimensional properties, a shattered dome city, and most importantly, The Thing That Rots From The Sky! The World of Calidar. This is Bruce Heard's new project, a setting explored through skyship-related fiction like his "Princess Ark" series in Dragon Magazine that dealt with Mystara. This is a generic setting/fiction related product, and while I'm not often for gamer fiction, I do think Heard's work is a good way to establish a setting. And it has skyships! This has already funded and is pressing on towards stretch goals. An Illustrated Bestiary of Fantastic Creatures. This is a project by an illustrator named Casey Sorrow that goes right after my heart: a richly illustrated bestiary for old school games. Sorrow lists the inspirational illustrators as "David C. Sutherland III, David A. Trampier, Tom Wham, and Jean Wells" - so you can get a feeling this is going to be a good one. Although really, our squid-type friend to the right should've told you that right off the bat. No stretch goals for this one but it's moving towards its finish line, with $970 out of $1600 raised so far. One of the reasons I am promoting all of these Kickstarters is that they are relatively modest goals, with good pricing points and realistic expectations from the project creators. There are no stretch goals that will bankrupt creators, and the projects are manageable rather than epic products that will bog the authors down. You get the book for Venger's module at $20, a softcover book for Calidar at $25 (or the book plus a poster map at $35), and the Bestiary is a mere $16. So check them out and get your old school on for 2014! Spoliers ahead if you will be playing in the module Tower of the Stargazer. Yesterday I ran another B/X game, and the players decided to check out some rumors outside of the Caves of Chaos. That was fine, as I have laid out some additional modules in an expanded woodland area (via a very rough sketch of a map that I drew). 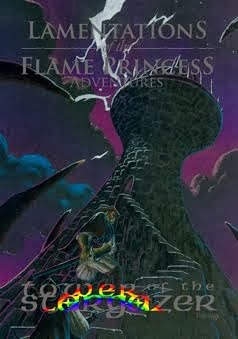 The adventure seed the PCs wound up following was the stories of mysterious lightning leading up to the Tower of the Stargazer. This was a very interesting transition from Keep on the Borderlands, simply because the modules couldn't have been more different in execution. No huge sprawling caves here, it's a very compact area. Rather than every corner hiding a lurking creature, there was danger of death at every step, but in a largely abandoned area. As Tower of the Stargazer runs, it feels like James Raggi read The Tomb of Horrors and considers it less of a one-off death trap and more of an artist's manifesto. 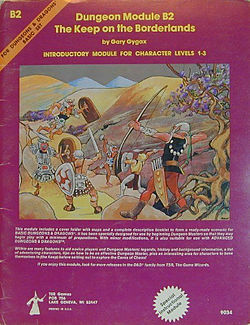 His module is more focused on tricks and traps and puzzles, than on monsters and demons. 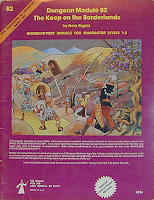 Even exploration is blown wide open for this module by having the elevator system - which allowed the PCs to see, and get, the treasure in the lowest level. The one PC who died did so because he insisted on looking in each mirror in Dungeon Level 1 and managed to fail every saving throw. (They did trigger the snake trap at the door but made their saving throws.) The surviving PCs figured out the switches in Dungeon Level 2 and got the treasure without a scratch, which gave each of them a level up. The wizard himself was a hilarious encounter for the already-wary PCs, who thought long and hard about trying to kill him but thought better of it. Part of why I enjoyed this was that it made a total death trap that still felt appropriate as an adventure for low-level PCs (in this case, a level 3 now ex-thief, a level 2 dwarf and level 1 fighter and cleric). 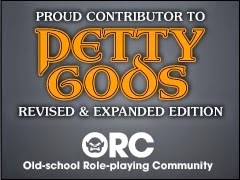 It also let me set the tone that not everything I'll be running is classic TSR in style, but felt like it worked well into the existing campaign. It's also a short module, but in a good way - whereas B2 gives you a ton of bang for your buck, Stargazer finishes smoothly without a dozen or more sessions. It's also worth a shout-out to J.D. Neal, whose town from JN1 The Chaotic Caves I've nicked as a settlement not far from the Keep on the Borderlands. It's a good alternative to just sticking with the Keep. In future sessions we'll have modules even further afield. But I do have to say, mixing Gygax and Raggi in a campaign isn't as hard as you'd think, and at least for Tower of the Stargazer it works to good effect. Apologies for the unplanned hiatus - being busy around the holidays and having a bit of writer's block doesn't help with blog productivity. I'll see about getting Dungeon Crawl 4 out before the end of the year but there's no guarantee there. In the meantime I've run a couple games set in B2 Keep on the Borderlands. It's worth noting how much play I've gotten out of this module, and the players are a ways from being done. The humanoids have been totally devastated for numbers, while the deeper caves have only just been scratched. The PCs played politics very well between the orc groups in the previous session, getting them to help in a raid that wound up killing both chieftains (with some PC trickery in the mix as well). The elf NPC with a vendetta proved quite bloody, though he wound up meeting his end last night, not at the hands of the orcs he hated, but from a group of zombies. He died having had his vengeance, so he was probably on his way out. B2 encourages a lot of play that I really find enjoyable as a referee. For instance, there was a lot of roleplaying that led to the orc slaughter; the reaction and morale systems are really important for this. In a room further down the caves, the PCs cleverly destroyed a dozen skeletons before setting off the trap that would animate them - although this attracted the zombie guards that killed the elf NPC and one of the PC fighters. In last night's game, surprise almost doomed a dwarf PC who's made it through many Stonehell and a few B2 sessions; he was in the path of the bear from my B2 wilderness encounter list. A 4 HD bear with 3 attacks per round is a formidable challenge to 1st and 2nd level PCs, even if they outnumber it. The bear won surprise and decided that the dwarf in his plate armor was a meal in a can, and he was determined to open it. High PC damage output did get the bear to break in morale and probably saved the life of Tybur. I've also been doing some preparatory work in expanding the wilderness area. It's a good basis for a bit of a sandbox with dungeon modules around it; I won't spoil exactly what is lined up, but once the PCs finally finish with B2 I think there will be some good opportunities.